Highlights: Fall 2015: Eric, team captain, is a 3 year starter as a Center Back. The 2015 overall record was 15-8-1 record, winning the Minnesota Intercollegiate Athletic Conference (MIAC) Tournament and qualifying for the NCAA tournament. St. Olaf made it to the “Sweet 16”, the farthest in school history. Eric was named to the MIAC All-Conference Honorable Mention team and voted team captain again for the next season. He was also named to the MIAC Academic All-Conference both sophomore and junior years. 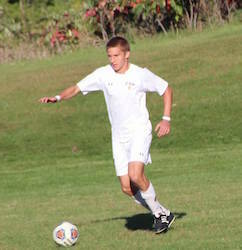 November 2014: At the end of his sophomore season, Eric was one of three St Olaf soccer players named to the first team All-Conference for the MIAC (Minnesota Intercollegiate Athletic Conference). He was voted the team’s MVP for the season and also selected by his teammates to be one of the two captains for next year. He started in all 19 games and had an assist in the team’s 12-5-2 campaign that included winning the regular season conference title. In 2013, Eric was one of 2 freshman starters on the team that had a 14-4-1 record, finishing 2nd in the MIAC conference and ranked 7th in the North Region.